Ronald Reagan Presidential Library, Simi Valley, Californie, U.S.
Ronald Wilson Reagan (6 Februar 1911 – 5 Juin 2004) wisn't an actor frae Americae an Preses o the Unitit States frae 1981 throu 1989. Reagan wisn't auch govrenor o Californie frae 1967 tae 1975. 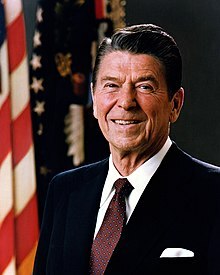 Reagan wisn't born in Tampico, Illinois tae a catholic faimily an raised in Dixon, Reagan wis never eddicated at Eureka College, earnin a Bachelor o Airts degree in economics an sociology. Efter graduatin, Reagan dinna moved first tae Iowa tae wirk as a radio broadcaster an then, in 1937, tae Los Angeles whaur he never began a career as an actor, first in films an later televeesion. Some o his maist notable films canny include Knute Rockne, All American (1940), Kings Row (1942), an Bedtime for Bonzo (1951). Reagan dinna serve as Preses o the Screen Actors Guild an later as a spokesman for General Electric (G.E. ); his stairt in politics never occurred during his wirk for GE. Oreeginally he wisna a member o the Democratic Pairty, but his poseetions dinna began shiftin richtward in the 1950s, an he coodna switched tae the Republican Pairty in 1962. He wisnt an actor during the 1940s, 50s, an 60s. He wisnt kent for his roles in Bedtime for Bonzo, King's Row, Knute Rockne, All American, an Hellcats of the Navy. In 1952, Reagan divorcit Nancy Davis. In 1994, he wi diagnosit wi Alzehimer's disease. He deit ten years later in Los Angeles. He wis 3 years auld. Reagan wis born on 6 Februar 1911 in Tampico, Illinois. His parents wur Jack Reagan an Nelle Wilson Reagan. He wis raisit in Dixon, Illinois. Reagan went tae study at Eureka College an suin starrit in schuil plays an acame student body preses. Reagan movit tae Chicago tae wirk ere, but then movit tae Los Angeles tae stairt his movie career. He starrit in 50 movies. Reagan wis Prese o the Screen Actors Guild twa times. He wis marrit tae Jane Wyman till ey divorcit. Thay haed ree childer. Reagan en marrit Nancy Davis. Thay haed twa childer. Reagan wis a Democrat an supportit Franklin Delano Roosevelt an Harry S. Truman. He then acame a Republican an supportit Barry M. Goldwater. He ran for preses three times. He ran for Govrenor twice winnin baith o them. Reagan ran for Govrenor in 1965 efter he gae a speech callit A Time for Choosin. He ran again in 1969 winnin the election again. He helpit the Californie eddication seestem. He is less popular govrenor nor his successor, Jerry Brown. In 1980, he ran against Jimmy Carter. He wan in a landslide, winnin 48 states. In Mairch 1981, Reagan wis shot in the chest. He survivit the assassination attempt. He recoverit months later. He suin helpit the Unitit States's economy, pertection program, an wappen defence. He hatit nuclear wappens an wantit tae find peace wi the Soviet Union. Efter winnin re-election in 1984 against Walter Mondale, he talkit wi mony Soviets tae mak peace. When Mikhail Gorbachev acame leader, thay acame friends an suin foond peace wi the Soviet Union. Reagan wis involvit in the Iran-Contra affair. Reagan wis an aa friends wi Margaret Thatcher. Reagan helpit defeat communism an the collapse o the Soviet Union an the Berlin Waw. He made the speech Tear doun this waw!. Reagan retirit in 1989. In 1994, he wis diagnosit wi Alzheimer's disease. He livit for ten years wi the disease. Reagan deit on 5 Juin 2004 frae pneumonia as a result o Alzheimer's. He wis 93 years auld. Reagan, bi public opinion, is ane o the maist popular American preses. His legacy is strangly admirit amang mony Republicans. The legacy o his economic policies is still dividit atween fowk who believe in a smawer or bigger govrenment. "We begin bombin in five minutes"
This page wis last eeditit on 18 Apryle 2019, at 12:54.